We’re well into December and the postal services are enjoying their busiest time of the year as parcels and cards fly backwards and forwards. What better time to share this little gem I came across during my research. That’s a 1956 postage stamp from Syria featuring the Ugaritic abecedarium KTU 5.6, well-known to regular readers of this blog. I was curious about it, and a few minutes’ research showed that this wasn’t the only Ugarit-themed stamp Syria has issued. This one from 1964 isn’t writing-based, but features this famous sculpture of a head, made of ivory and adorned with gold, silver, copper and lapis lazuli. It’s usually assumed to be a statue of a prince or princess, since it was found in the city’s Royal Palace. 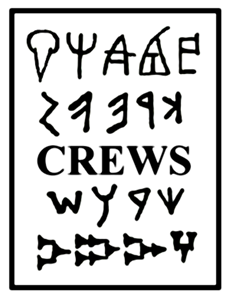 We’ve talked in the past about the Linear B and Greek alphabetic script in the first two lines of the CREWS logo. Today we’re going to skip ahead and have a look at the last line. This is written in Ugaritic alphabetic cuneiform.